The most fun I’ve had working on a project has definitely got to be the Beats by Dre earphone commercial we directed back in film school. This was a group project designed to simulate the production of a television/online video advertisement. I chose this particular product due its notoriety at the the time we created this. Everyone was going crazy over the new Beats, and I felt this was a good way to channel some creative direction while immersing myself and the rest of the crew in some old school hip hop vibes. Check it out, below. My first semester in the Masters program at Bond University certainly proved to be a creative challenge. In our Advertising Masterclass we were assigned a client for which to construct a complete advertising campaign including print, video, and social media. Given my design background, I was happy to come control of the creative aspect of project. Below are some of the promotional material I designed for PURE Snow, a snow sport line of gear and apparel produced by PURE Brandz. I’ve recently joined an incredible team of creative folk working at Rabbit Radio, an Internet-based community radio station operating from Miami Marketta on the Gold Coast. I was given the exciting opportunity to host and produce my own show as well as a chance to do some design work that I’ve been lacking significantly. Below are some of the posters and other promotional design I’ve worked on this past year. Crowd Analysis: Are bloggers considered professional journalists? The 21st century has brought forth a new age of accessing and disseminating information. The traditional methods of publishing information, particularly, news reporting, are increasingly becoming easier to broadcast and access by millions of people. Devices found on desks, in pockets, and now more commonly, part of an outfit, have become the equivalent of a printing press (Blood, 2003). The days when people would wait to hear the news either on television, through the radio, or the morning paper, are slowly waning. Turning to social media for breaking news, celebrity tabloids, or political updates is now becoming the norm. The elements of journalism that include gathering, processing, and disseminating news and information related to the general public interest are shifting with the adaptation to new media: social media. The author of this post raises the question, “Are bloggers considered professional journalists?” Through the analysis of participatory culture, blogging, and a case study examining the publishing phenomena, Huffington Post, this post intends to determine the relationship between professional journalism and the blogosphere. For several decades, the world has been immersed in the socio-economic fruit of the Second World War, consumerism (consumer culture). Shifts from local towards global media affected everything including politics, marketing and advertising, technology, communication, and control over the flow of information. The Internet brought forth a new medium of information dissemination; a more personal, unfiltered, anonymous form of communication. Eventually, a new culture was born: participatory culture, a ‘coup d’état’, if you will, to the prominent consumer culture. The public has shifted from consumers to prosumers; contributing and producing content rather than strictly consuming. The term ‘Participatory Culture’ refers typically to the publishing of privately produced content. The most successful businesses have concluded that utilizing the growth of ‘participatory culture’ is the way forward in terms of market value. Sharing and crowdsourcing prove to be the new solution to several, traditionally corporate, services through digital media. A Weblog or Blogging is defined as the production or publishing of personalized websites containing various content including text, images, videos, as well as links to information and commentary found on other Web pages. These publications are updated regularly, and for the purpose of this discussion, refer specifically to blogs publishing public-interest information and commentary. Generally, blogs are personally published, and few bloggers are compensated financially for publishing their work. Instead, contributing intellectual property is compensated through a sentimental and social incentive: being part of the global conversation. Courtney C. Radsch defines citizen journalism “as an alternative and activist form of newsgathering and reporting that functions outside mainstream media institutions, often as a response to shortcomings in the professional journalistic field, which uses similar journalistic practices but is driven by different objectives and ideals and relies on alternative sources of legitimacy than traditional or mainstream journalism.” In other words, the audience, which usually receives the information through controlled institutions, are now using their communication devices to inform one another, distributing information unrestrictedly. Simulating a global publishing press, of course, entails its own risks and implications. Participatory journalism brings its own set of implications to the discussion. The increasing amount of content produced every second of every day suggests that journalism must adapt and advance in order to remain as true to its traditional norms and practices. Controlling the flow of information, simply by collecting and broadcasting news is no longer an efficient strategy of disseminating news. Bloggers, citizen journalists, and social media personalities are increasingly becoming the first line of collecting and sorting information, publishing both news worthy material and opinionated pieces of discussion. The common method of receiving news was what was legally, ethically, and professionally published through conventional media channels (radio/TV/newspapers). Blogs are the modern equivalent of a combination of all the above mentioned media, sparing the consumer the overwhelming mass of content provided on news websites, and online magazines. The audience is now able to select, filter, archive, and share what is relevant, and discard what is not of interest. Considering blogging as a resource of news reception implies an occurring shift in the consumption of news and information. Social media enables an individual to actively pursue their interest in a specific news event in print, broadcast or online, rendering the extensiveness of information as a secondary objective. Participatory culture dictates that the prosumer both creates and shares news, current affairs, opinions through the convenience of easy-to-create websites and blogs. In this context, blogs provide a varied and wide-ranging mix of news and information, as well as an awareness of what is trending and being discussed globally. The information shared is content-oriented but also provides framework for the activities of others on the weblog. The Huffington Post is an American online news aggregator and blog founded by Arianna Huffington alongside several other columnists. The online publication offers news, blogs, and original content and covers politics, business, entertainment, environment, technology, popular media, lifestyle, culture, comedy, healthy living, women’s interests, and local news. The Huffington Post has many bloggers—from politicians and celebrities to academics and policy experts—who contribute on a wide range of topics. Wilson Lowrey explains his article Mapping the Journalism–Blogging Relationship that there has been much discussion about how blogging can foster open, intelligent, and productive public discussion, and how bloggers can spur journalists to produce more accurate, honest, and socially relevant reporting. These optimistic notions may be warranted. Yet journalists and bloggers may be more interested in maintaining or seeking authority than on benefiting society. Individual motivation and action are also constrained and fostered by social factors such as organizational resources, professional processes, and technological change. It is necessary to map the relationship between journalists and bloggers so that these factors can be seen plainly. The fundamental challenge that providers face in developing online news broadcasting media is to discover the value that they and their journalists can add for users. News services still serve familiar fulfilments, they inform on public affairs and practical matters, provide topics for conversation, as well as entertain and help the public pass the time. With the increasing amount of options that seem more desirable that news, it is becoming more difficult to maintain the public’s attention and interest. Some media and news organizations believe that blogging can be a crucial and benefiting part of their overall news package. According to Rebecca Black, this accomplishes several things: “it adds transparency to the usually hidden editorial writers to write in a more lively and personal fashion, and lets the public see that the paper’s editorial board isn’t monolithic.” Other publications are allowing their journalists to blog separately, promoting their own style of writing, while gaining more exposure through social media sharing. At a time when media control is more concentrated and when presenting genuine news with credible sources can be another obstacle in the way of journalists, limiting their voices and give in to a political or corporate agenda, bloggers are the vigilantes of the media world. The gatekeepers have been able to maintain a close watch over institutionalized news organizations, ultimately controlling the flow of information. In a manner of speaking, therefore, ‘participatory culture’ is the revolution that empowers the consumer to become more in control of what is presented to them, day in and day out. Contributing, creating, modifying, updating, and sharing information in order to advance and inform. When previewed through the lens of participatory and crowd culture, Weblogs should not be considered in isolation but as part of an emerging new media ecosystem— a network of ideas. As J.D. Lasica explained in her article No one should expect a complete, unvarnished encapsulation of a story or idea at any one Weblog. In such a community, bloggers discuss, dissect and extend the stories created by mainstream media. These communities also produce participatory journalism, grassroots reporting, annotative reporting, commentary and fact-checking, which the mainstream media feed upon, developing them as a pool of tips, sources and story ideas. The relationship is symbiotic. Blogs present a vehicle for expressing thoughts and reportage that doesn’t always fit the contours of a traditional news report. Weblogs are helping to expand the boundaries of experimental forms of transaction journalism. Contributing to overall process of news gathering and reporting is causing both positive and negative implications on professional journalists. News is gathered through multiple digital sources and linked in blogs through Hypertext, allowing the creator of the post to claim credibility, although in reality, it is quite difficult to ensure the facts are non-falsifiable. The rise of “horizontal media” that made it quick and easy for anyone to share links with large numbers of people without the involvement of a traditional media organisation; in other words, people can collectively act as a broadcast network. It might be that mass media of tomorrow will evolve, as Paul Andrews predicts, to move towards the blogging paradigm and journalism will expand from a centrelized top-down, one-way publication process to many-hands, perpetual feedback loop of online communications. For now, to the extent that bloggers’ efforts prod journalists to be better at what they do, because ultimately, there is no substitute for quality journalism. Large news organisations are already adopting and incorporating their contributions through digital media, the blogosphere, and have slowly started to abandon the attempts to be first to break news, focusing instead on being the best at verifying and curating it, as well as allowing readers and viewers to get involved in newsgathering, verification and curation of news, making them part of the news-distribution system as they share and recommend items of interest via e-mail and social networks. Instead of being the only method of dissimenating news and distributing information, journalists are opening up the conversation and allowing bloggers to contribute mainstream social media exposure. Bloggers and journalists will work both together and simultaneously to add value to the conversation by providing reporting, context, analysis, verification and debunking, and by making available tools and platforms that allow people to participate. Blood, R. (2003). Weblogs and journalism: Do they connect. Nieman reports, 57(3), 61-63. Barthelemy, S., M. Bethell, T. Christiansen, A. Jarsvall & K. Koinis (2011). “The Future of Print Media.” Capstone Report. Brydon, D. (2011). “Transnational Literacies: Redefining Knowledge Mobility for the DigitalAge.” Literary Migrations. Lasica, J. D. (2003). Blogs and journalism need each other. Nieman reports, 57(3), 70-74. Lowrey, W. (2006). Mapping the journalism–blogging relationship. Journalism, 7(4), 477-500. As the sun begins to set on one of the most exciting chapters of my life, I reminisce on the memories that I’ve accumulated over the years; the friends that I hold dear to my heart, the good times that I will forever recall fondly, and the hard times that have taught me valuable experience. It seems like only yesterday. But to grovel in nostalgia is the utmost redundant thing to do in a situation like this. Time is of the essence, as they say. And with what little time I have left in writing this chapter, I intend to glorify the moments in which love, friendship, and spiritual mirth is ever-present. The word ‘Photography’ is derived from the Greek ‘photos’ for light and ‘graphos’ for drawing. In other words, the artist at hand here is light. And what photographers essentially do is somehow capture and, at times, manipulate what would otherwise be a straightforward photograph as a means of “creating” an image rather than simply recording it. Captured above is an artwork by light, recorded and manipulated by yours truly. 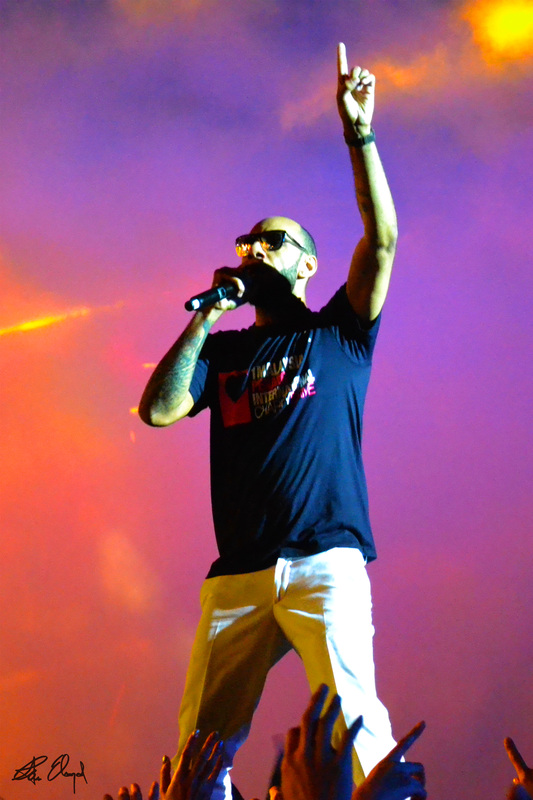 The incredibly talented Swizz Beatz gave nothing less than a great performance at the 1Malaysia Penang International Charity Drive concert on the 20th of April, 2013.